New/1st Visit Clients: Please be advised that submitting this request for a reservation does not automatically confirm your reservation until you hear directly from the Cedar Dale Staff with a confirmation and any additional instruction. If you haven't heard from us within 24 hours, please call us in case your confirmation email didn't go through properly. Vaccinations: We require that all required vaccinations be current at the time of services and that a copy of those vaccination are provided to us either by mail, fax or email before arrival or a hard copy can be provided at check-in. Adding A 2nd Pet: If you have more than one pet please complete the form on this page for each of your pets so we will have all of the information we need for our records. After your first stay you will not need to fill out anything other than the Returning Client Request Form to make reservations for your multiple pets. Daycare Program: If your pet will be participating in our daycare program while boarding for the first time, we do require you to complete our Daycare Owners Agreement. Medications: If your pet has medications and/or special medical issues, please tell us about them on the reservation form, or at check-in. If these conditions are more serious, please phone us ahead of time to discuss any additional services or care which might be required. If you have more than one pet (cat or dog), please complete our New Client Form for each pet who will receive Cedar Dale services. 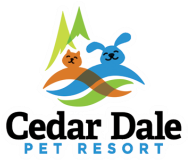 You will only need to complete the New Client Form once for each of your pets - for the next time you use Cedar Dale you may use our shorter Returning Client Form. If you have any questions or need further assistance be sure to phone us for we are always happy to answer your questions. Visit Us On Facebook for our activities, events and what your pets are up to during their stay. ﻿If you are running late in dropping off or picking up your pet we may be able to can make special arrangements for you to drop-off or pick-up, additional fee may apply. Late arrivals & departures are by APPOINTMENT ONLY and are subject to a surcharge. ﻿OPEN WITH LIMITED HOURS ON HOLIDAY DATES Limited check-in & check-out ONLY on the actual day date for ALL major holidays. Holiday departures pay for the FULL day of boarding & activities, regardless of check out time. CALL US TO FIND OUT ABOUT OUR LIMITED HOLIDAY HOURS. Cedar Dale Pet Resort - ALL RIGHTS RESERVED.